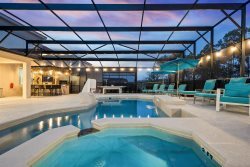 This beautiful pool home in Storey Lake accommodates up to 23 guests. The grand room in the center of the home is a perfect gathering area for the entire party. The spacious layout opens up to the living room, kitchen, dining and the outdoor areas of the lanai & pool deck, allowing fluid interaction between activities. The home includes 5 elegant bedrooms with king size beds and 4 themed bedrooms with 2 twin-sized beds in each, one being a bunk bed. The kids will love the playful themes! The upstairs loft is a great hangout with cozy sofas for lazy movie nights. For your convenience, the home also includes a washer & dryer with iron & ironing board. The pool and the spillover spa opens up before a gorgeous lake view.